Song written by Kate Bush. Originally released on her fifth studio album Hounds Of Love. Released as the second single from the album on 14 October 1985. The song is about the very close relationship between psychologist and philosopher Wilhelm Reich and his young son, Peter, told from the point of view of the son. It describes the boy's memories of his life with Reich on their family farm, called Orgonon where the two spent time "cloudbusting", a rain-making process which involved pointing at the sky a machine designed and built by Reich, called a cloudbuster. The lyric further describes Wilhelm Reich's abrupt arrest and imprisonment, the pain of loss the young Peter felt, and his helplessness at being unable to protect his father. The song was inspired by Peter Reich's 1973 memoir, A Book of Dreams, which Bush read and found deeply moving. 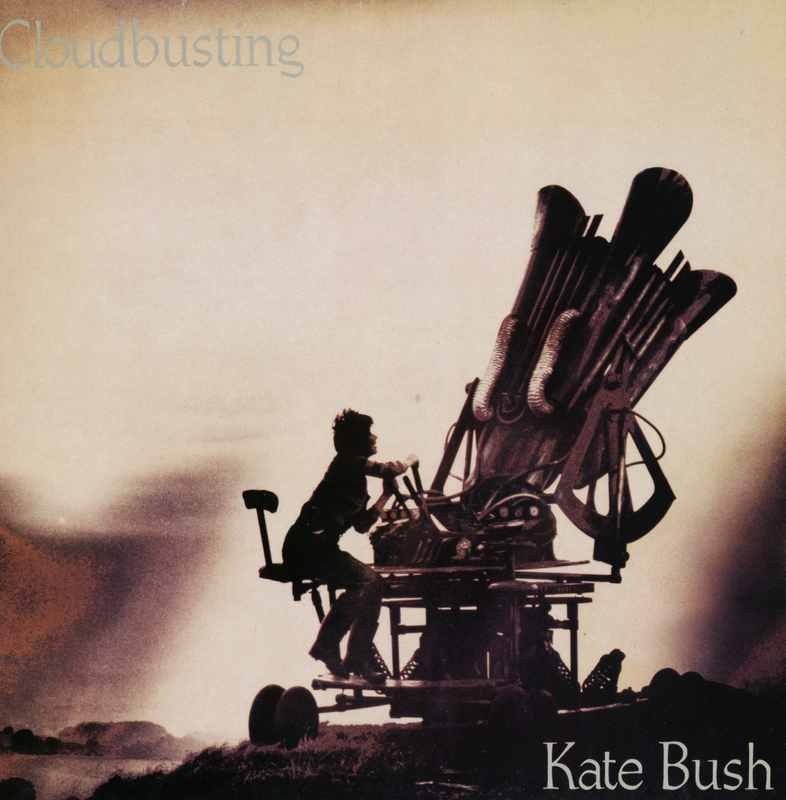 Kate actually contacted Peter Reich to explain her motives in writing 'Cloudbusting' and to express the wish that she hoped he would approve of the song. She received his reply a while later, saying that he loved what she was doing. 'Cloudbusting' was released as a 7" single and 12" single in the UK and Europe. The 7" featured Burning Bridge on the B-side; the 12" single consisted of the extended Organon re-mix of 'Cloudbusting', plus Burning Bridge and My Lagan Love on the B-side. In the USA, the single was released in 1986. The 7" single featured The Man With The Child In His Eyes on the B-side. The 12" single incorrectly called the extended version of Cloudbusting 'The Meteorological Mix', and featured The Man With The Child In His Eyes and Sat In Your Lap on the B-side. A promotional CD-single was also made, featuring both the album version and the extended remix of Cloudbusting, plus the two B-sides. There are three different versions of 'Cloudbusting': the album version (which was identical to the single version), the video version (released on CD in 1994) and the 12" remix entitled 'The Organon Re-Mix', released as a 12" single in 1985 and later on CD. The music video was directed by Julian Doyle and was conceived by Terry Gilliam and Kate as a short film. 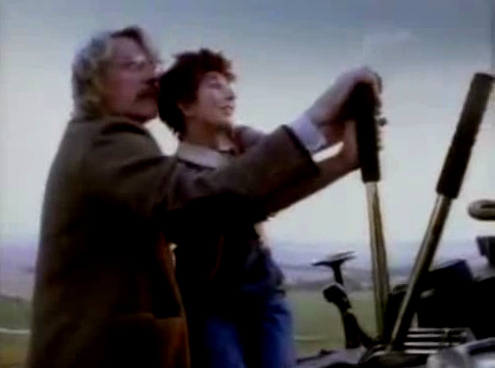 In it, Canadian actor Donald Sutherland, portrays Wilhelm Reich, and Kate Bush, portraying his son Peter. Filming took place at The Vale of White Horse in Oxfordshire, England. Bush found out in which hotel Sutherland was staying from actress Julie Christie's hairdresser and went to his room to personally ask him to participate in the project. The video shows the two on the top of a hill trying to make the cloudbuster work. Reich leaves Peter on the machine and returns to his lab. In flashback, he remembers several times he and Peter enjoyed together as Reich worked on various scientific projects, until he is interrupted by government officials who arrest him and ransack the lab. Peter senses his father's danger and tries to reach him, but is forced to watch helplessly as his father is driven away. Peter finally runs back to the cloudbuster and activates it successfully, to the delight of his father who sees it starting to rain. In the UK, the music video was shown at some cinemas as an accompaniment to the main feature. Due to difficulties on obtaining a work visa for Sutherland at short notice, the actor offered to work on the video for free. Although the events depicted in the story took place in Maine, the newspaper clipping in the music video reads "The Oregon Times," likely a reference to Reich's home and laboratory Orgonon. The Cloudbusting machine in the video was designed and constructed by people who worked on the Alien creature and bears only a superficial resemblance to the real cloudbusters, which were smaller and with multiple narrow, straight tubes and pipes, and were operated while standing on the ground. In a reference to the source material of the song, Bush pulls a copy of Peter Reich's "A Book of Dreams" out of Sutherland's coat. Kate performed 'Cloudbusting' in the German show Show Vor Acht in September 1985. This was a lipsynch performance. Another lipsynch performance happened on RAI television in Italy (date of broadcast unknown). The song was also performed as the last encore during Kate's Before The Dawn shows in London, 2014. The reviews for the song, when it was released as a single, were a mixture of acclaim, bewilder and incomprehension. Jane Simon in Sounds wrote: "Makes me shiver. (...) The string sextet will wrap themselves around your nervous system... I really think she does this sort of thing deliberately." Record Mirror's Andy Strickland: "Infuriatingly catchy bit of stringy nonsense." NME's David Quantick: "A fine vocal... married to a rotten boring tune and some orchestral wittering." Caroline Sullivan in Melody Maker: "A dreamy gentle intense Sousaesque marching tune chockablock with the unsual whimsey." 'Cloudbusting' was covered by Anthem In, Theo Bleckmann, Clay Broome Band, Kat Devlin, E-Clypse featuring Emma Price, Thomas Eklund, Geographer, Goodknight Productions, Göteborgs Symfoniker, Neil Halstead, The Hounds Of Love, Nick Jaina, Just Us, Little Beards, Charlotte Martin, Matches, Richard Navarro, Novembre, Paper Crows, Benoit Pioulard, Niki Romijn, Storm Of Capricorn, Swimmer One, TM Collective, Twilight Singers, Two Librarians on the First Floor and Wild Nothing. The song was sampled by Utah Saints for their track Something Good. The song was sampled by Beyond for their track Still Dream. The song was remixed by Just Us and released as Everytime It Rains in 2016, before they covered 'Cloudbusting' with an other vocalist in 2017. UK punk band P.A.I.N. used a sample in their song 'Eastern Dub (Wilhelm Reich In Hell)', without permission of record company EMI. Cloudbusting. Wikipedia, retrieved 1 November 2014. Graeme Thomson, 'Under The Ivy: The Life & Music Of Kate Bush', cop. 2012. ISBN 9781780381466.